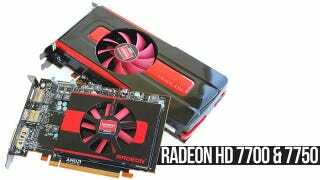 Having covered the $549 and $449 territories in January with the Tahiti-based Radeon HD 7970 and HD 7950, AMD is bringing its latest generation GPU to mainstream brackets today. The new Radeon HD 7770 and 7750 use the same 28nm design process and Graphics Core Next (GCN) architecture as the 7000 series flagship, albeit in more affordable configurations. The move to 28nm lets AMD squeeze 1500 million transistors into a 123mm2 die. In addition, the HD 7700 series die is 26% smaller than the HD 6770, while containing 44% more transistors. As impressive as those figures are, gamers will be more excited to see AMD's prices: the HD 7770 is $159 — in line with the GeForce GTX 560 — and the HD 7750 is even cheaper at $109, combating the GTX 550 Ti. As discussed in our preliminary Radeon HD 7000 review, the new series represents AMD's most significant graphics architecture overhaul in the last decade. It was back then that AMD adopted the Graphics Parallel Core architecture, employing groups of scalar processors that work out very long instruction words, commonly abbreviated as VLIW. Radeon HD 5000 cards used VLIW5 and last year's HD 6000 series transitioned to a more sophisticated VLIW4 architecture. However, the HD 7970 and other cards based on the Tahiti core replace VLIW stream processor clusters with Graphics Core Next compute units. GCNs are basically GPUs that can handle both graphical and computing tasks with high efficiency. Sound familiar? It's AMD's answer to the Nvidia Fermi architecture to which they transitioned in 2010. So essentially, a shader cluster is now called a GCN compute unit and each unit is a super-scalar processor with scalar and vector elements that follow a new non-VLIW instruction-set architecture. This architecture is more efficient and delivers more power per millimeter square of GPU die area. The HD 7770 and HD 7750 feature a new 9th Generation Tessellation Geometry Engine with optimizations such as increased vertex reuse, off-chip buffering improvements and larger parameter caches. This helps boost performance at all tessellation factors with up to 4x the throughput of the HD 6900 series (Gen 8). The Radeon HD 7770 measures 21cm (8.2in) long, a typical length for a modern mid-range graphics card. For reference, the GeForce GTX 550 Ti also measures 21cm long, as did the HD 6850. The GPU core runs at 1GHz, which is the highest frequency any Radeon card has been clocked at. The HD 7700 is clocked 18% higher than the HD 6770, while its GDDR5 memory is slightly faster at 1250MHz (5.0GHz DDR). Still, pairing that frequency with a minuscule 128-bit memory bus gives the HD 7770 72GB/s of theoretical bandwidth, which is actually slightly less than the HD 6770. The HD 7770 still only comes loaded with a 1GB frame buffer — the same as previous-gen mid-range cards. We don't doubt that board partners will release 2GB versions, but because HD 7770 isn't designed for extreme resolutions, 2GB models aren't likely to provide a performance boost. The HD 7770's core configuration also differs from the older HD 6770's. The new card carries 640 SPUs, 40 TAUs and 16 ROPs. In comparison, that's actually 20% less SPUs than the HD 6770, while the TAUs and ROPs remain the same. Cooling the "Cape Verde XT" GPU is a large circular aluminum heatsink paired with a 75mm fan that generates very little noise during standard operation and under stress. The HD 7770 operates at near silence because even under load it only draws 80 watts and as little as 3 watts at idle, courtesy of the ZeroCore Power technology. The heatsink and fan are enclosed in a custom housing that conceals the front side of the graphics card, this is the same design that the HD 6770 used. Nvidia also employed a similar design with its GTX 560 series. To feed the card enough power, AMD has included a single 6-pin PCI Express power connector — the same setup you'll find on the HD 6770 and GTX 560, as well as numerous other mid-range graphics cards. Naturally, the HD 7770 supports Crossfire and so there are a pair of connectors for bridging two or more cards together. The only other connectors are on the I/O panel. Our AMD reference sample has a dual DL-DVI connector, a single HDMI 1.4a port and two Mini DisplayPort 1.2 sockets. All HD 7700 series cards support a max resolution of 2560x1600 on up to three monitors. With a multi-stream hub using the Mini DisplayPort 1.2 sockets, the HD 7770 can drive up to five screens. The Radeon HD 7750 is shorter than the HD 7770 at only 17cm (6.6in) long, 1cm shorter than the old HD 6750. Previously only AMD's low-end cards, such as the HD 6450, have been as compact as the HD 7750. Whereas the HD 7770 comes very aggressively clocked at 1GHz, the HD 7750 operates at a more conservative 800MHz, which is still 14% higher than the HD 6750. The HD 7750 still features 1GB of GDDR5 memory clocked at 1125MHz using a tiny 128-bit bus, supplying a bandwidth of just 72GB/s. The HD 7770 and HD 7750 differ greatly in their core configurations, as the latter features 512 SPUs, 32 TAUs and 16 ROPs. This is surprisingly modest and the HD 7750 has 29% less SPUs and 11% less TAUs than the HD 6750. The HD 6750 also produces slightly more memory bandwidth, so the HD 7750 will have to bring some significant efficiency gains if it's going to beat its predecessor. The HD 7750 reference card has a single slot cooler that uses a low-profile heatsink and fan measuring just 1cm tall. The heatsink itself is 11cm long, 7.5cm wide and is cooled by a 65mm fan. However, the HIS version we have uses a dual-slot cooler that stands 3cm tall and features a 9cm x 7.5cm heatsink. The HIS cooler will likely provide better results but its dual-slot design will make it less desirable for compact setups. Unlike the HD 7770 and the HD 6750, the HD 7750 doesn't require additional power via external connectors, making it ideal for lower-end systems. The HD 7750 doesn't have a Crossfire connector but a pair of cards can still take advantage of Crossfire technology. The I/O panel has a dual DL-DVI connector, a single HDMI 1.4a port and a DisplayPort 1.2 socket. Again, all HD 7770 series cards support a max resolution of 2560x1600 on up to three monitors. With a multi-stream hub using the Mini DisplayPort 1.2 sockets, the HD 7750 can power up to four screens.